The 6th annual Decisiv Maintenance Summit took place recently at Decisiv's headquarters in Glen Allen, VA. Over the five-day event, representatives from leading fleets and service providers came together to discuss critical issues affecting fleet maintenance in the trucking and transportation industries. The importance of improving the warranty process: Fleets mainly want to maximize coverage, while service providers prioritize maximizing repair reimbursements. The ineffectiveness of current customer satisfaction measurements: Fleets and service providers agreed that current customer satisfaction measurement tactics are ineffective, as surveys are generally sent to accounts payable personnel who have little to no connection to service and repair events. The need for more OEM information at the point of service: Fleets and service providers agreed that more access to key OEM information (warranty, service bulletins, recalls, shared network service history and preventive maintenance status) at the point of service would yield more efficient processes and improved uptime. Despite advances gained from using technologies such as Service Relationship Management (SRM), conversations revealed that fleets and service providers still need to focus more on communication with one another. Providers expressed frustration at getting requests from fleets to expedite repairs, only to see those same assets remain in their lots for days after the repair is completed. 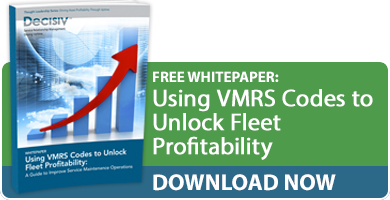 Pre-event surveys also revealed a surprising discrepancy between fleets and service providers regarding the importance of VMRS coding. Fleets ranked this as the most important service event management attribute, while service providers ranked it last. All in all, the summit provided fleets, service providers and manufacturers an opportunity to learn from one another and brainstorm ideas for improving fleet maintenance, increasing efficiency and maximizing uptime. By communicating and collaborating through a Service Relationship Management (SRM) platform, all parties agreed they should be able to continue to experience gains. Check back to the Decisiv blog in the coming weeks for more detailed updates on the summit. What are your main frustrations with service event management? Where do you see the most opportunities to improve fleet maintenance? Please share your thoughts by posting a comment below. Discover how improving communication and collaboration between fleets and service providers helps you maximize uptime. Schedule a demo of Decisiv's Service Relationship Management (SRM) platform today.